For any family, storage is crucial for helping keep the home clutter-free. If you’ve got the space, why not build a window seat with storage in a family room or play room? It adds extra seating, makes for a great, cozy reading nook, and gives you another place to quickly and easily hide any clutter that occurs in your day-to-day living right before the guests come over. Walls are bound to take a beating when you have kids running around. If they’re bored, they want to bounce their basketball off their closet door. When they come home from softball practice, they’re kicking their cleats off against the baseboard. Of course, there’s also the inevitable drawing-on-the-wall experiment that everyone does once during childhood. Choosing paints that are easy to clean is a great option when you’ve got kids. If you’ve got a little artist, and you want to give them room to create, a chalkboard wall in the bedroom is another fantastic idea. You can also mix magnetics (which you can find at a home improvement store) and paint a wall in a busy hallway to hang up artwork or school work. You don’t just have to focus on how durable furniture materials are (though that’s, of course, important). You can get fun, stylish, and creative too! 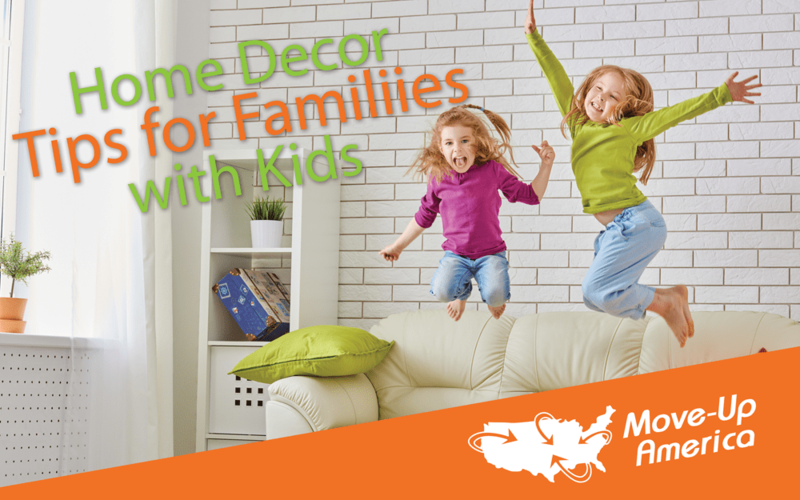 There are a lot of fun ways to decorate your home that not only keep it kid-friendly, but also let’s your families’ personality shine through. Move-Up America values family needs, and our services can be very beneficial to those who are looking for the right home, especially in the case of growing families! Contact us today to learn how we can help you and your family.